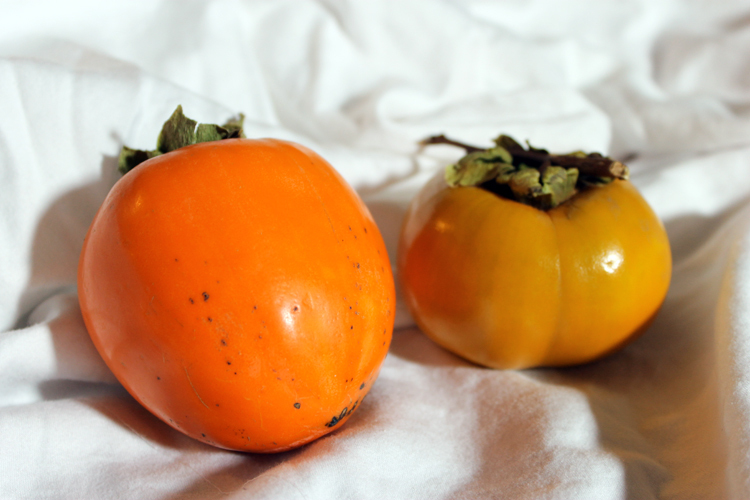 Hachiya persimmon on the left, fuyu on the right. We’re at the cusp of fall and winter. We have a month to go until the solstice, and yet the air smells like winter and all colors are blue near dusk. The evenings, when they aren’t sodden wet, are smoky from people trying to create little pockets of dry heat and comfort. There’s a tall persimmon tree on the way from my house to Eric’s. All the leaves have blown off. It’s just the orange fruits bobbing on the branches in the wind like ornaments. Crows perch at the top, pecking and guarding the sugary fruits, scolding people who get near, who might steal their sweet fall food. The type of persimmon you get in the grocery store is the Asian or Japanese persimmon, scientific name Diospyros kaki. Kaki is the Japanese word for persimmon, one of the few words I learned living in Japan. The tree I watch for ripening is a hachiya persimmon, as opposed to a fuyu persimmon. While fuyus are fairly innocuous when unripe, hachiyas are extremely astringent from tannins. Unripe hachiyas are like eating a bitter piece of chalk covered in fur, but the ripe fruit is sweet and soft, jelly-like. They hachiya are acorn-shaped, while fuyu tend to be rounder like a tomato. Last year, Eric fashioned a harvesting pole out of a piece of bamboo. He used a coat hanger to act as a hook and cut a plastic bottle in half to act as a scoop. Pretty much it was a hook at the end of a long stick with a plastic basket big enough to hold one persimmon. We used this to get the persimmons that were too high for us to grasp with our hands. This year, we saw a couple taking the lower fruit with a store-bought harvesting pole before we had a chance to bring our shoddy makeshift one out of storage. The fruit that remains is too high for us. Only the crows can get it. I grew up believing that persimmons only came in the initially bitter (hachiya) variety and that they were quarter-sized. The school bus stop closest to my house in Maryland had a persimmon tree. The fruits were unbearable until the first frost or two. Then they would crinkle and probably be safe to put in your mouth. The wrinklier, the better. The persimmon trees of my childhood are Diospyros virginiana, native to North America. Also, I do know of a persimmon tree near the intersection of Willamette and Ainsworth. I used to bike past it every day and be surprised by the little mini pumpkins I would see after the leaves fell. Mini pumpkins! That’s a nice visual comparison.